Fee: $1900 Four full days shooting in the field with mid-afternoon slideshows and photoshop demonstrations. Some of Ohio's most unique and beautiful songbirds wait until the grasslands reach a certain maturity before they begin nesting. In July the grasslands are alive with colorful wildflowers, berries, and filled with birdsong. 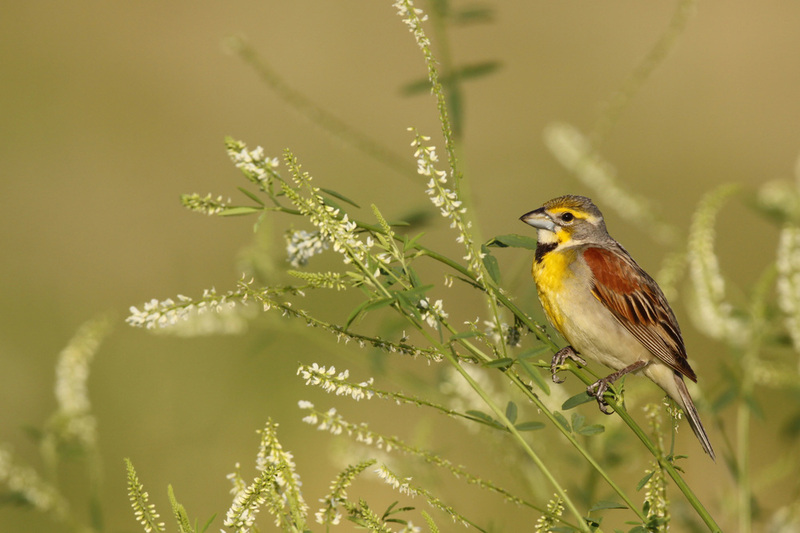 During this photo tour we will visit several of my favorite summer parks in the greater Cleveland area targeting Dickcissel, Indigo Bunting, Henslow's Sparrow, and more. Our hotel sits just outside Ohio’s only National Park in the Cuyahoga Valley. From here, we will have easy access to the Valley and a variety of metro parks in the area. Each morning we will meet around dawn in order to maximize our productivity during the trip. My goal is to help each of the four participants walk away with as many high quality images as possible. We will create set-ups and simply photograph the birds on their own terms as well, depending on the situation. During harsh mid day light we will go over some slideshows and processing tips, as well as have some free time. We’ll have another long shooting session each evening until the light fails, and then have dinner as a group for whoever wishes to join. We will meet each morning in the hotel lobby of Holiday Inn, Richfield, Ohio. This is where I recommend staying, but feel free to camp or stay at any of the other hotels in the area. Best airport: CLE in Cleveland is certainly the closest airport. The Akron/Canton airport is only 40 minutes away and may offer cheaper flights at times. Either location will be good. Service will be good during the entire trip. Physical Activity Requirements: Moderate activity. This trip will require several hikes into fields in order to get close to the grassland birds. Up to a mile hike over level terrain each afternoon or morning session will be necessary. We’ll be shooting near the car most of the time. Participants will need to follow Matthew in their own vehicle to the shooting locations. Carpooling is optional. Each participant must have their own transportation. Carpooling will be optional. Usually each participant follows me in their own vehicle through the forest. Once I find a cooperative bird, we pull off the road and start working on a setup. Please have breakfast on your own before we meet in the morning. We usually eat at Panera Bread or Chipotle for lunch, and I have found some locally owned and run restaurants in the park that are fun for dinner. Bring a sample of your own work if you like. It can be fun to share during lunch break to get to know each other’s work. A positive attitude. One negative person can put a cloud over the whole trip but good attitudes are contagious as well!